Five mornings out of seven the alarm goes off at 5:30 am. I am often tempted to hit snooze, however, my alarm clock is strategically placed in the bathroom. Getting up out of bed and walking down the hall to the bathroom to hit snooze for another five minutes of sleep doesn't seem worth it. Once I'm up. I'm up. And I have one hour to take a shower, get dressed, apply my mask of makeup, make lunch, make breakfast, make coffee and wash last night's dishes. I have to make The Boy's bed (because at some point in the middle of the night, he has wandered into our bed but that's for a whole other post.) and pick up his toys and books. I get The Boy's clothes and take them into the living room where I will help him get dressed. I pour out a bowl of cereal - sans milk. I drink my coffee while watching the local news and I try to figure out what to wear for myself. Though my own outfit, takes much less thought than The Boy's. I drag him out of our bed and walk him into the bathroom. His eyes are half closed, his bare flat feet slapping the wood floor. I pull down his pajama pants, yank off his shirt and pull off his pull-up. "Pee pee in the potty?" I ask. "No way," he says. The Boy isn't a morning person. "Norrin. Fix it." I say. We say 'fix it' when he needs to fix his tone of voice or when he's being disrespectful. "No I do not wish to do pee pee in the potty," he says. This response kind of makes me giggle. 'I do not wish...' is his latest phrase thanks to The Cat in the Hat. I wash his hands and face. "Now it's time to brush teeth," I announce. And this is the hardest part of our morning routine. 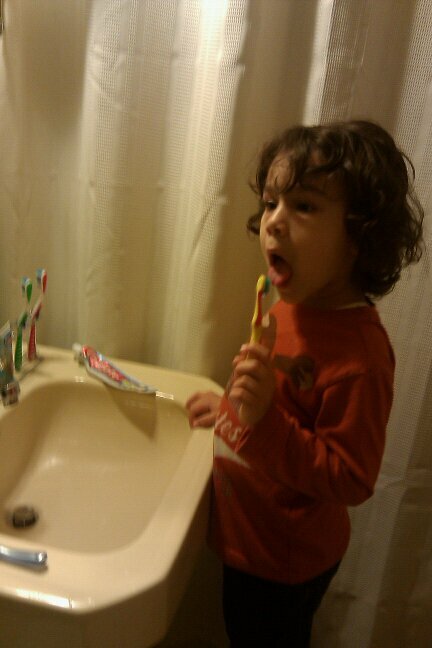 The Boy hates brushing his teeth. "No! No! No!" He screams and starts to make a run for it. But I grab him. Now this next part is always a little dramatic. I stand him on the step stool in front of the sink. I stand behind him, the weight of my body pinning him against the sink. I bend slightly, wrapping my left arm around his body and with the toothbrush in my right hand, I press my elbow against his chest, holding him down to brush his teeth. I pry his mouth open with the toothbrush and my index finger. This is tricky business. The Boy has been known to bite. By now it's 6:50 and I still need to get him dressed and hope he eats some cereal before heading out. I get him dressed while we watch Good Day New York. I realize the dressing and tooth brushing are opportunities for The Boy to work on his self-help IEP goals. But who has that kind of time when bus pick up is at 7:19? That has to wait for the weekend when there's more time. The Boy sits at the table and picks the pink cheerios out of the bowl - he'll eat those first before the plain cheerios. I rush around, doing the last minute thing: spritzing perfume, lotion on hands, grab the cell phone, check the book bag. It's 7:07 by now and we have to go. The Boy is no longer at the table but in the bathroom - standing on the step stool, brushing his teeth. Well, more like eating the toothpaste. "Good job Norrin!" And I pull out of the bathroom because now we really have to go. I realize that he doesn't exactly hate brushing his teeth, he hates me brushing his teeth. Hats. Scarves. Coats. Bags. We are out the door. I see the bus already in front of our building and I tell The Boy to run. I hate making them wait. I kiss The Boy goodbye and prompt him to say good morning to the driver and matron. "I'm so sorry. Am I late or are you early?" I ask the driver. "Actually we're right on time," she says. And that seems to sum up our manic weekday mornings. Never too early. Never too late. Always right on time, with some seconds to spare. Daily morning routines are very chaotic with my 2 yr old especially if he wakes up in one of his moods. He wants to play with toys when its time to get dressed. I also had to take the bus with him stressful in itself plus drop him off at sitter and fly another bus to get on train all of this just to earn a pay check and depending on trains more stress. I feel your pain. If I could stay home I would. I suspect that parents of one child think manic mornings are only in their home. 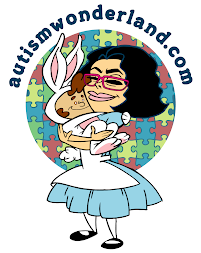 Truth is I believe they are in most homes of young children, even those without diagnoses.